I’ve got one of those headaches, you know, right round the eyes when you’ve been trying not to cry. 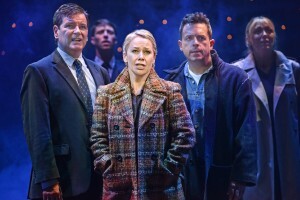 Despite that, I loved Blood Brothers tonight at The Theatre Royal in Nottingham, even if it does leave you in tears. It is the first time I’ve seen the show and was overwhelmed by its brilliance. It’s what I call a proper musical, in that it ticks all the boxes; Professional, compelling story, fantastic cast and beautiful musical numbers. There are few shows nowadays at which the audience doesn’t applaud after each number. It wasn’t until the second act that it dawned on me that no one was clapping. Not because it wasn’t deserved, but that we were all so absorbed in the story, in a way in which you felt you were viewing the intimate details of a families life, that it would have seemed almost inappropriate. We watch the tangled story unfold, much like the narrator (Robbie Scotcher). He lurks in the shadows cast by this dark tale. He watches through windows with a sense of foreboding, and we view with him as he guides us through this moving production. Weaving in and out, interacting with the characters, and yet unseen. Writer, Willy Russell, tells the captivating story of twins, separated at birth because their mother cannot afford to keep them, and so they grow up streets away but worlds apart. Whilst we’ve seen stories of a rich/poor, class and divide in tales such as The Prince and the Pauper, or more recently The Princess Switch. This story is no fairytale. This is Willy Russell, writer of Shirley Valentine and Educating Rita, doing what he does best; humour with deep dark undertones. Folks must love a good tragedy, the lady sat next to me tells me this is the ninth time she’s seen the show, which has been breaking hearts for 30 years. Set in the 70’s, Bob Tomson and Bill Kenwright’s production doesn’t feel dated, and packs as much passion and punch as any new show. The lady next to me also says Sean Jones who plays Mickey has been in it for twenty of those years?! I’ve no idea if this is true because he definitely doesn’t look that old and certainly manages to keep the performance fresh, but maybe that’s a credit to his acting. When the ‘children’ first appear on stage, for a moment you think ‘Ok, weird, an adult playing a child. This is going to be cringeworthy’ But in seconds you’ve forgotten that this isn’t a 7 (nearly 8) year old in front of you (Another feat that few plays, with the exception of perhaps The Kite Runner, manage) However, Sean Jones delivers a believable and powerful performance, transistioning from cheeky innocence to adolescence and mental illness in mesmerising fashion. His mother, Mrs Johnstone, is played superbly by Linzi Hateley, who pours emotion and meaning into each line and song. Left by her husband, with no money, several children and twins on the way, a deal is struck with her employer, the childless and desperate Mrs Lyons – played perfectly by Sarah Jane Buckley, that she will take one of the one of the twins. He will be raised with a privileged lifestyle whereas her own is poverty-stricken. Like Sean Jones, Mark Hutchinson who plays the other twin, captures the magic of childhood in his performance. The chemistry between the pair being faultless. Unaware of their true identities, and much to their mothers dismay, a friendship blossoms. 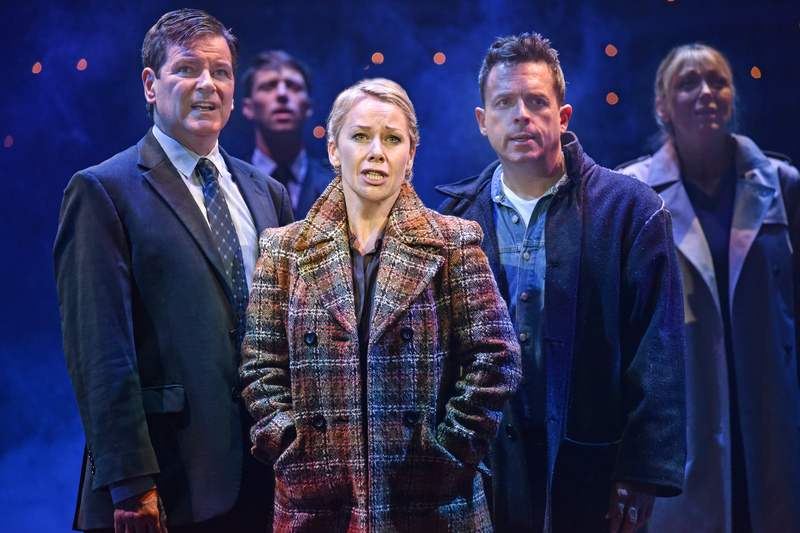 Amongst an endless tirade of juke box musicals, Blood Brothers stands out as an original and classic story. It’s everything they’re not; gritty, captivating, heartbreaking and absolutely not feel good. The cast go through such a rollercoaster of emotions that I feel drained just watching them. By the final number, a haunting version of ‘Tell me it’s not true’ from Linzi, there’s not a dry eye in the house, and the standing ovation, which saw the cast return not once, but three times is thoroughly deserved. An absolute classic.